As he and his fleet flee Carillon, Commander Adama reminisces about a mission against the Cylons in his youth. Feeling the weight of leadership after the fleet's narrow escape from Carillon, Commander Adama reflects on a time when he was merely a warrior...and wanted to be more. 20 years earlier, as a lieutenant, he is assigned to the battlestar Cerberus. There, he meets Lt. Cain, the best pilot in the service, and the two form an instant rivalry. Later, Commander Odysseus sends the two on a mission to take out a Cylon scanner dish in advance of an attack on a Cylon base on Onaka III by the Cerberus. The pair are successful and the Cerberus destroys the base. Lt. Cain admits he may make a warrior out of Adama yet. "Baptism of Fire" was originally serialized in 8 page installments in issues 1-3 of Asylum, an anthology title published 1995-1997 by Maximum Press. The story was reprinted in Battlestar Galactica: The Compendium from Maximum Press in 1997. In his journal entry, Commander Adama notes that it is Colonial Yahren 7342 and it has been 3 sectons (~weeks) since the Battle of Carillon and no further Cylon encounters have yet occurred. However, according to the BSG Timeline on the Battlestar Wiki, the year 7342 is unlikely based on what we know of the TV episodes. The only date given in the TV series is the Colonial yahren 7322, when the Cylons attacked Umbra on Caprica, causing Starbuck to become orphaned at about the same age as Boxey, as mentioned in "The Man with Nine Lives". The characters' ages are presumed from the actors' ages at the time: Noah Hathaway as Boxey was 7 and Dirk Benedict as Starbuck was 33. From this it is deduced that the destruction of the Colonies occurs in 7348. On page 1, panel 1, Adama's reflection in the porthole window shows the left side of his face and hand...from the way he's standing, it should be his right side reflected! Page 2 reveals that young Lt. Adama, after an engagement in sector 475, was assigned to the battlestar Cerberus, under its legendary commander, Odysseus. The Cerberus is not mentioned as one of the battlestars at the Cylon ambush at the armistice, so it was presumably destroyed at some point between this flashback story and "Annihilation". The artist of Part 1 of the story, John Fang, appears to have mistakenly used the modified designs of the Galactica and other Colonial ships and artifacts as seen in Maximum Press titles depicting the latter years of the ragtag fleet's journey to Earth rather than the classic look seen on the TV series. Page 4 reveals that Adama is part of Bronze Squadron on the Cerberus. On page 5, Adama mentions that before the Cerberus, he had served for a few yahrens on the now all but destroyed Solaria. In the novelization of "Saga of a Star World", the Solaria is one of the four battlestars destroyed by the Cylon attack at the armistice. But she was never mentioned in the TV series itself. On page 5, we learn that Tigh (Adama's friend since the Academy) was also recently stationed on the Cerberus. Adama refers to Commander Odysseus as a living legend, a call back (forward?) to Commander Cain's appearance in the 2-part "The Living Legend" story in the TV series. Cain, as a lieutenant, is also stationed on the Cerberus at this time. On page 9, the artist labels the viper pilots' helmets with their names as a shorthand method of keeping the characters identifiable in the obscuring helmets. Possibly this is also an homage to the Marvel BSG comic book series which did likewise in its 1979-1981 series. The helmets do not appear to have a symbol on the front though as they do at the time of the armistice. 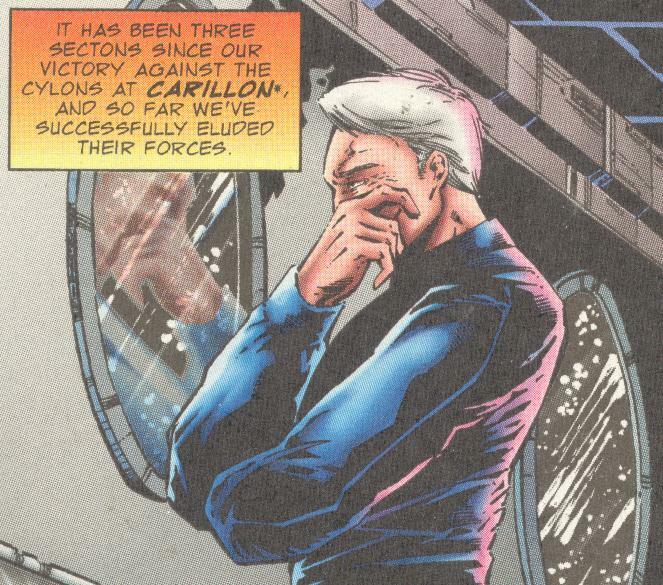 On page 11, panel 3, Cain's and Adama's hair color appears to be switched around. On page 13, Commander Odysseus details a strike to be made on a heavily-fortified Cylon outpost on Onaka III. Also on page 13, Odysseus mentions an apparently blind creature called a Sagatarian (sic) Hardshell. 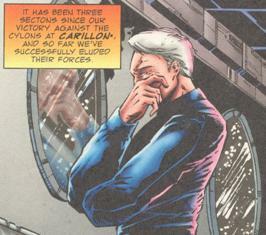 The Cylon's primary scanner dish on Onaka III, depicted on the screen behind Commander Odysseus on page 13, does not appear the same as it is depicted in the rest of the story. Perhaps the image on the screen is merely an example of a Cylon scanner dish and not the specific one on Onaka III due to the difficulty in getting images of an enemy base. In his journal entry on page 15, Adama says the events of his and Cain's mission on Onaka III took place 20 yahrens ago, which would have made it the Colonial yahren 7322. Letterer Kurt Hathaway seems to have misread "Onaka III" in the script as "Onaka One-Eleven". I suppose it's possible that I'm misreading "Onaka 111" as "Onaka III", but since the number is commonly known in science-fiction to relate the number of planets from the sun (or moons from a planet), 111 seems ridiculously large! Possibly it could be argued that Onaka 111 is an asteroid, but since it is depicted as having a breathable atmosphere, it would have to be a larger mass than an asteroid would provide. Page 17 shows us the first appearance (chronologically) of a golden-hued Cylon officer. On page 22, Adama mentions that he and Cain were awarded the Medallion of Kobol for their successful mission on Onaka III.